Ketchup is America's favorite condiment and can be found in 97 percent of kitchens across the country. But you may be surprised to learn that this ubiquitous accompaniment to French fries wasn't born in the U.S., nor did it contain any tomatoes. Instead, ketchup has its origins in China and began as a pickled fish sauce. After a few hundred years and several different versions, the ketchup we know and love today was created. The word ketchup is derived from the Chinese word ke-tsiap, meaning a pickled fish sauce. This mixture was mainly added to recipes to season a dish, versus served as a condiment. It is believed that this fish sauce made its way from Vietnam to the southeastern part of China, where it became a standard food item. From there, it traveled to Malaysia and Indonesia where its name morphed into kechap and ketjap respectively. Here, seventeenth-century English sailors discovered the delights of this Chinese seasoning and brought it west where cooks tried to replicate the dark sauce. As the Chinese version is more akin to a Worcestershire sauce, the British used ingredients such as anchovies or oysters, mushrooms, and walnuts to recreate those flavors. In turn, ketchup came to mean a condiment consisting of mushrooms. The English settlers brought this mushroom ketchup to America, where it continued to gradually go through various changes. One significant alteration was the addition of tomatoes, which first appeared in a recipe by Sandy Addison in 1801 in The Sugar House Book. The recipe called for squeezing the tomatoes dry and then salting and boiling them. After pressing through a sieve, the tomato is combined with mace, nutmeg, allspice, cloves, cinnamon, ginger, and pepper to taste. It is then boiled until thick, cooled, and bottled. The bottled ketchup will last for several years, due to the amount of salt, which also made the ketchup taste, you guessed it, very salty. Because tomatoes are part of the Solanaceae family, which consists of certain poisonous plants, many people steered clear of eating fresh tomatoes, but were willing to consume ketchup, since the red fruit was cooked and preserved with other ingredients. Thus, the popularity of bottled ketchup begins. It may surprise you to know that Heinz was not the first bottle of ketchup sold; that credit goes to a farmer named Jonas Yerkes, who was selling bottles of ketchup nationally by 1837. It wasn't until roughly 40 years later that the F. & J. Heinz Company began selling tomato ketchup, and by the end of the nineteenth century, it was the primary type of ketchup in the United States. 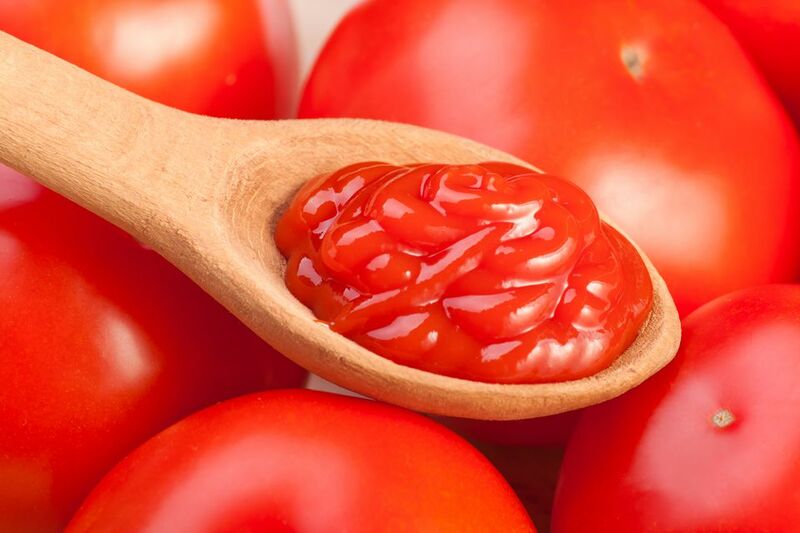 Gradually, the descriptor of tomato in "tomato ketchup" was dropped from its name. Originally, unripe tomatoes were used, which required the addition of a preservative called sodium benzoate to prevent spoilage and loss of flavor. But in the early 1900s, the Food and Drug Administration banned the use of this additive, and Heinz began making their ketchup with ripe tomatoes, which contain more of the natural preservative pectin, and adding sugar and vinegar. Due to the increased amount of pectin, the resulting ketchup was thicker than the watery previous version. Over the years, ketchup has evolved from the bottle to the large pump, small packets, and even a short-lived selection of different colored varieties (with the addition of food coloring). Heinz chose the spelling "ketchup" to print on their labels, but catsup and catchup are acceptable spellings used interchangeably. However, ketchup is the way you will find it listed in the majority of cookbooks.